Still, she said, the rental market for apartments looks ever better for Forest Forest City. That raises a question as to whether the professed justification for modular--to save money on time and labor--still holds. Development of each site is still generally expected to occur from west to east in a clockwise direction, starting with the arena block. As each building is completed, irrespective of its actual sequencing, it must conform with the 2006 Design Guidelines for that site and provide the necessary permanent facilities such as public access, open space, below-grade parking, infrastructure retention/detention capacity, and other commitments. 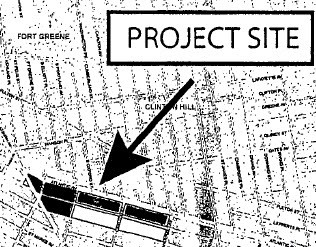 Note that, as proposed in June 2003 before Atlantic Yards was officially unveiled, that southeast block was not even part of the project and not seen as blighted. It was added by December 2003, perhaps because it was the only piece of terra firma outside the arena block and thus available for both construction staging and below-ground parking. The ESDC still must start and complete a court-ordered Supplemental Environmental Impact Statement regarding the second phase of the project; this presumably changes things somewhat. 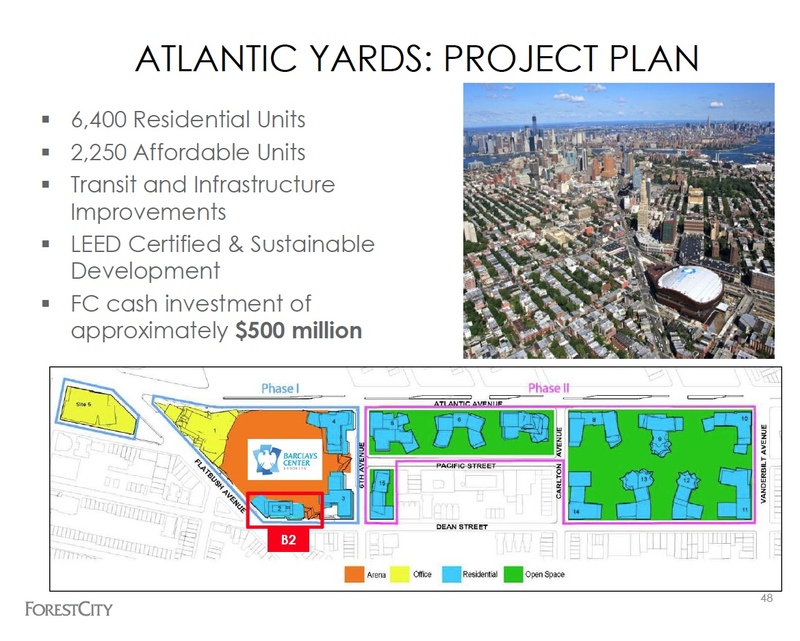 Early in the event, Forest City Enterprises CFO Bob O'Brien offered a cryptic comment about Atlantic Yards: "When you look through that $940 million under development, a substantial amount sits here, at Atlantic Yards, which is 6,000-plus units, long-term. We don't have approval for all of those 6,000 units--that effort still is going to continue... And so, allocating that cost over what period of time and however many units is going to take years to happen." Was her referring to the fact that there must be a Supplementary Environmental Impact Statement regarding Phase Two of the project? Maybe. But that's not expected to seriously affect the approval of those towers. Early on, CEO Bruce Ratner talked about the long road to getting the arena built, and the future of Atlantic Yards, saying it relied both on hard work and a bit of luck. "The luck piece of it, I think, was the Brooklyn market," he declared. "I don't think we ever, ever anticipated overall that Brooklyn would be as hot and important as it is. Not only in media, in art, in journalism, in food, but also in real estate. I would venture to say it's probably the best residential market, maybe in the country. Manhattan is also very good, but Brooklyn, I would say, is probably even stronger." "Frankly, I'm a bit surprised myself," he continued. "I've always had a lot of confidence in it. Obviously, our Atlantic Yards project is evidence of that. 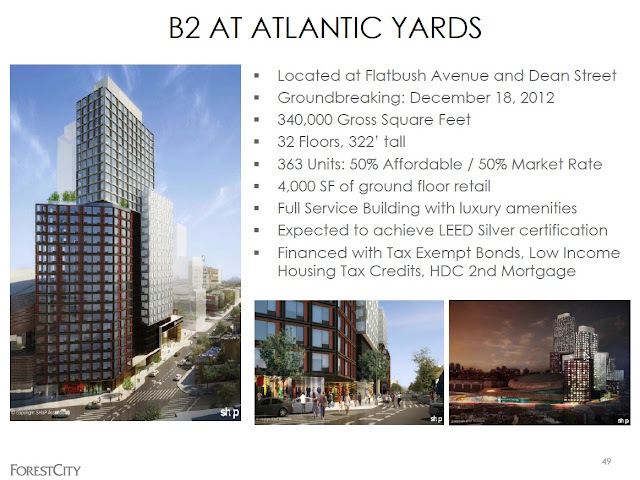 I believe really for 15 or 20 years that this would be a very good residential market in Downtown Brooklyn." Note that the first four towers on the arena block were initially supposed to contain offices. The first and largest tower, planned to rise on a triangular site over what is now the arena plaza, is on permanent hold. "I don't think I quite guessed Williamsburg, but I certainly did guess Downtown Brooklyn," Ratner continued. "I always thought it was ripe for--one of the unusual things about Brooklyn, unlike Manhattan, not a lot of is zoned high-rise.... You see see, what we have, just to the left here, 6000 units, is of great value... It is very valuable to have land, it's very hard to find land that's zoned with high density zoning in Brooklyn. Along the waterfront, yes." Of course, Atlantic Yards is not quite zoned for high-rise. Rather, the state overrode zoning to allow Atlantic Yards to be built at the density Forest City deemed economically necessary. 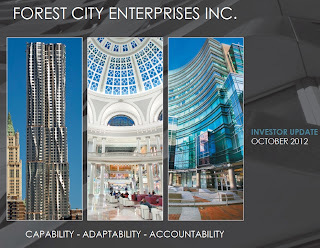 Gilmartin, speaking to investors, said Forest City plans 1500 units on the arena block. The first tower, B2, is being built on a site "fairly close to the size of 80 DeKalb," the tower Forest City built at Fort Greene Park. "Much of what we're doing with B2 has been done in the likeness of 80 DeKalb, which has turned out to be a tremendous building for us," she said. B2 should have about 363 units, half at market-rate, half subsidized (though with few larger units). "It is a building that, in many ways, drafting in behind the strength of the Brooklyn market," Gilmartin said. "It is really the center of gravity for much of which is culturally hip and relevant today. The notion of high rise, amenitized living has been proven out in the construction of a number of buildings that enjoy robust rents, very low vacancy rates, strong absorption, and minimum concessions. These are rents that are in the mid-50s." "This is just what we see today," she continued. "And we see very, very, very generous increases in rents at 80 DeKalb as those units are re-rented. We're very enthusiastic about this building." 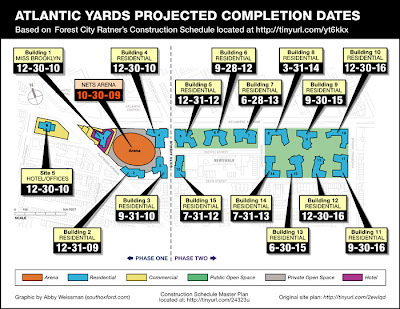 Note that rents approaching $55 are well above the rents expected in 2013 and 2014 in the August 2009 KPMG report on Atlantic Yards commissioned by the ESDC, a report that concluded that Forest City's expectations were "moderately aggressive." Instead, it looks like the Brooklyn market has boomed. "We have designed this building in two ways," Gilmartin said, repeating the plans for conventional and modular construction, which would "allow us we believe to save a significant amount if we do it." "We will announce which building we're building prior to commencing construction," she said, "but we are ready for either building." One analyst asked about the building's cost and financing. Gilmartin said it was no time for specifics, as "we are actively working to secure and close the financing." She said they were "far enough along on the financing that we have a general understanding of what the equity will be." Gilmartin said it would take 18 months to reach substantial competition, then another few months for close-out of construction--to build a conventional building. A modular building should go faster. "We are a union shop," Gilmartin responded. "Part of what makes the modular discussion, and the decision to go modular a big decision is that it will have along with an understanding with labor to do it with union labor, at a price point that deviates from construction costs. And that is one of the things we're completing on our to-do lists... [It's] not conventional union construction in terms of methodology or wage rate." Would rents be different between a modular or conventional build? "It's an issue we spent a lot of time on," Gilmartin said. "We brought in outside experts. We believe if we go modular, it would be invisible to the consumer. This building should perform at the level of finish, fit and feel commensurate with a conventional building, so it is priced accordingly." She wasn't asked whether buyers would be expected to have any nervousness about either the fact that it would be the world's tallest modular building or they'd be living next to an arena, with busy crowds outside on most days for a period of time. Platform designs, Gilmartin said, "have become quite sophisticated and simplified at the same time," given other developers' plans to build on the West Side Yards in Manhattan and other projects. While Forest City has planned scenarios "where we build the platform at certain estimated costs," she said, "certainly the focus of the day is the arena block... There's a second block, 1129, which is terra firma... These four buildings here... we have seven buildings that we will build before we commence construction on any platform buildings. And so, we're working on it, but I can tell you that the focus today is on the arena block." Where, one analyst asked earlier in the meeting, has the company created the most value? 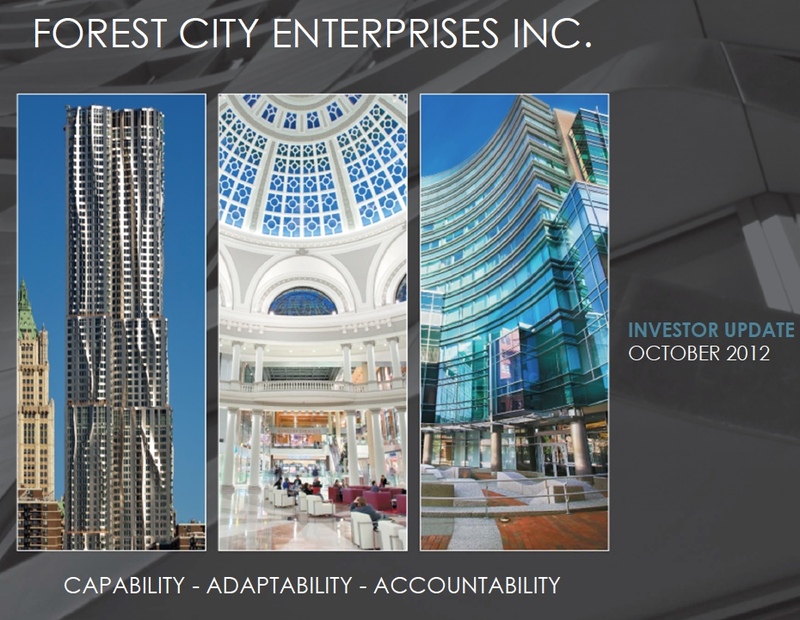 O'Brien pointed to Forest City's "core market strategy," relying on certain hot metro areas. And while retail malls were once "tremendous value creators," there's less opportunity today. "When you create a sense of place, when you take what was an old wire factory, an abandoned wire factory in downtown Cambridge, and turn it into University Park at MIT--people know where University Park at MIT is," he said. "People want to be there. There's a wonderful park there.... It benefits tremendously from the fact there's institutions of higher education there." "But there's a big barrier to entry," O'Brien continued. "It's hard to develop in New York, it's hard to develop in Boston and DC. Those barriers allow us, over time, to create and grow value in the portfolio that we have. We see less opportunity in building--that's why we're getting out of strip [mall] center business... From our perspective, creating a sense of place in urban America, particularly in the cities that we mentioned...[is the goal]." Of course, in Brooklyn, they demolished renovated--and renovation-worthy--factory buildings for Atlantic Yards. -In addition to the satellite lot, there are occupied townhouses and other buildings in the footprint of building #15. Given FCR's stated preference for building on all "terra firma" sites before the railyards, are there still seizures by eminent domain in the pipeline here? -What about Site 5? Modells may have just remodeled, but are their days numbered? -Am I to assume that the "four buildings" mentioned by FCR are Buildings #11-14? I don't have any definitive answer on this, but eminent domain could be invoked at some later date, which means that it could lead to Building #15. That's a housing tower, so there is a presumed demand. The Site 5 building may be an office tower, so the demand is more variable. If they can lure a Panasonic (like they tried), you may see a tower on Site 5 go up. It would appear, as someone who walks by frequently, that there is very limited room between the edge of the arena and the edge of Dean Street, to build a 30+ story tower. Additionally, that end of the arena houses a ticket office and building entrances for the public as well as the truck elevators that presumably service the arena. Won't all of those things need to be re-considered if a building will now be going up there? It seems this would effectively nullify access to the southern part of the arena. It scares me to think what else can now go up at those heights. Bergen Tile has been vacant for a long time now. Does Ratner own that too? Another developer looking to take advantage of our new "skyscraper alley"...? It's supposedly about the same footprint as the 80 DeKalb Avenue tower in Fort Greene. I think the real question will be how much construction pushes out into the sidewalk and street, not whether it will affect building/truck entrances. The Bergen Tile site is owned separately and, as I wrote this morning, is a smaller building (but too large, says the community board, on the Dean Street side).